← TELL ORR, DETROIT CREDITORS: STOP DEBT SERVICE TO BANKS; RALLY FRI. JUNE 14, 9 A.M. This photo of Aiyana Jones is from her cousin Mark Robinson’s Facebook page. 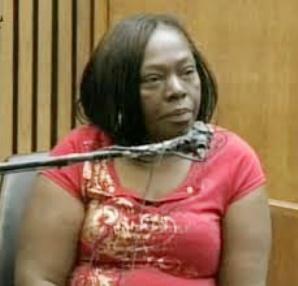 DETROIT – Testimony from Aiyana Stanley-Jones’ grandmother, Mertilla Maria Jones, who was sleeping with the child when Detroit police officer Joseph Weekley shot the 7-year-old to death May 16, 2010, kicked off the second week of his trial on charges of involuntary manslaughter and reckless use of a firearm resulting in death. 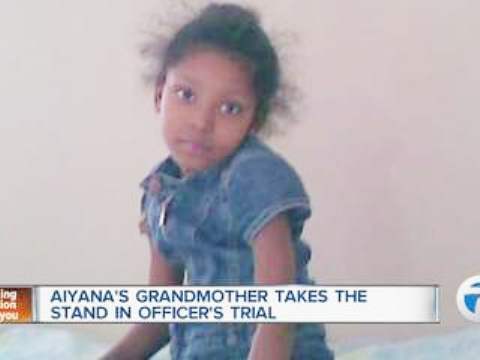 Mertilla Jones on stand during trial of Officer Joseph Weekley, who shot her 7-year-old grandchild Aiyana to death. The trial is taking place in front of an all-white jury except for one Black male. The jury has never even been shown a photograph of the disarmingly pretty little girl. Aiyana Always, from Mark Robinson’s Facebook page. Jones, who said that she and Aiyana were “very close,” broke down sobbing uncontrollably. Wayne County Circuit Court Judge Cynthia Gray Hathaway called a half-hour break. Jones was composed when she took the stand again. Jones testified she had been about to warn the police that a child was on the couch, but did not have time to get the words out of her mouth. She said her sister Joann Robinson was sleeping on a black couch on the south side of the living room. Robinson died June 15, 2011. Jones has attributed her death to the grief and shock from the day Aiyana was killed. She described how Aiyana’s father Charles exited his room. 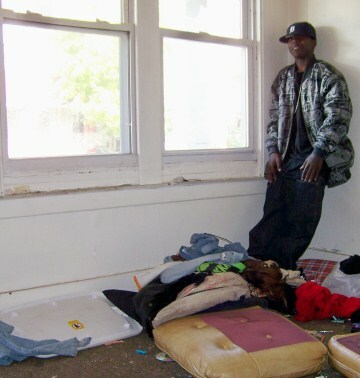 Aiyana’s cousin Mark Robinson in room where she was killed, the morning of her death. He testified he warned police there were children in the house. She told Assistant Wayne County Prosecutor Robert Moran the police never said why they arrested her, or told her anything about Aiyana’s condition. She said she never grabbed Weekley’s gun, that physically she could not reach up and touch anyone. She said in earlier videotaped testimony shown to the jury that the police ‘would have shot the hell out of me’ if she had grabbed the gun. Jones demonstrated how the officer she later came to know as Weekley was holding his MP5 submachine gun, cradled in one arm with the muzzle pointed at a downward angle, directly at the arm of the couch where Aiyana’s head lay as she slept. Earlier testimony showed Weekley was also carrying a large ballistic shield, although the MP5 is usually operated with two hands according to other testimony by officers. 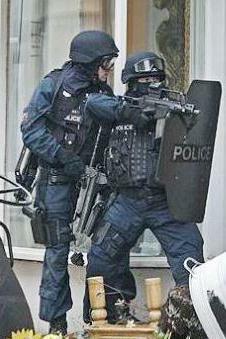 Cop in real-life photo holds submachine gun in one hand and ballistic shield in the other, similar to Weekley’s stance, although Mertilla Jones testied Weekley held his gun pointed downward at a 45 degree angle. 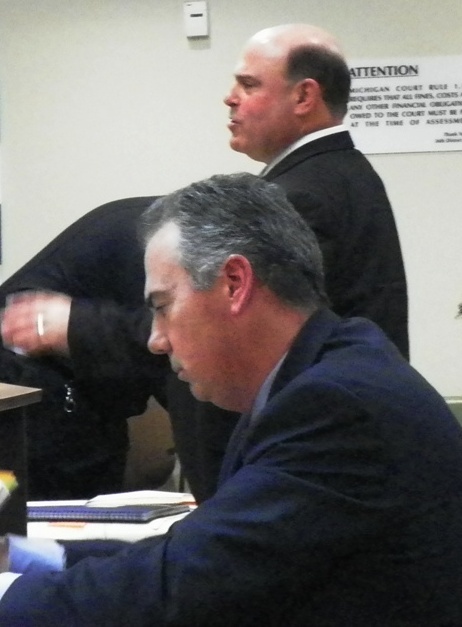 Defense attorney Steve Fishman then began a grueling cross-examination. He asked her whether she had given testimony, starting with the police interrogation, and proceeding to the grand jury and civil case depositions. He said she had also given statements to the media. Fishman showed a brief clip of Jones’ interrogation by the police, and a police report in which she says “flying glass and gunshots” came through the window, attempting to impeach her earlier testimony. Jones read the police report, and said she didn’t remember saying it that way. She testified she did not write the police report, and shouldn’t have signed it, but was in shock. 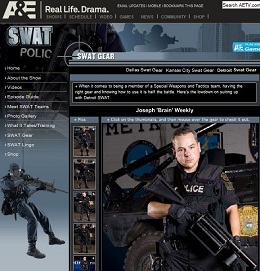 Killer cop Joseph Weekley as star on previous A and E DETROIT SWAT page. Fishman asked her whether she had testified that she reached up to grab her granddaughter. She confirmed earlier testimony she had given that Weekley murdered Aiyana. 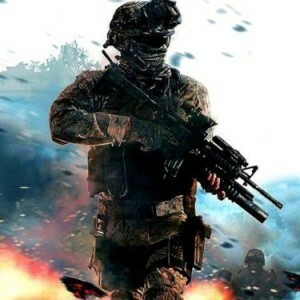 The prosecution has charged him only with involuntary manslaughter and painted a picture of a professional police team that would never deliberately kill anyone. Fishman said during opening statements that if Weekley had deliberately pulled the trigger on the gun, he should have been charged with first-degree murder. 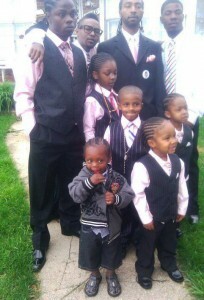 Charles Jones, little sons, and family members before Aiyana’s funeral. Other police officers have testified that they are trained in “trigger discipline,” to keep their finger off the trigger even if someone tries to take their weapon. Testimony has also been given that it takes 6 to 8 lbs. of pressure to pull the trigger on an MP5. He asked Jones if she hated the police for killing Aiyana, for arresting her son Charles and her daughter’s boy-friend Chauncey Owens in the killing of Je’Rean Blake, 17, and for arresting and successfully charging another of Jones’ sons, Norbert Jones, with first-degree murder. Norbert Jones was sentenced the month after Aiyana’s death. His mother has said he was unjustly convicted. 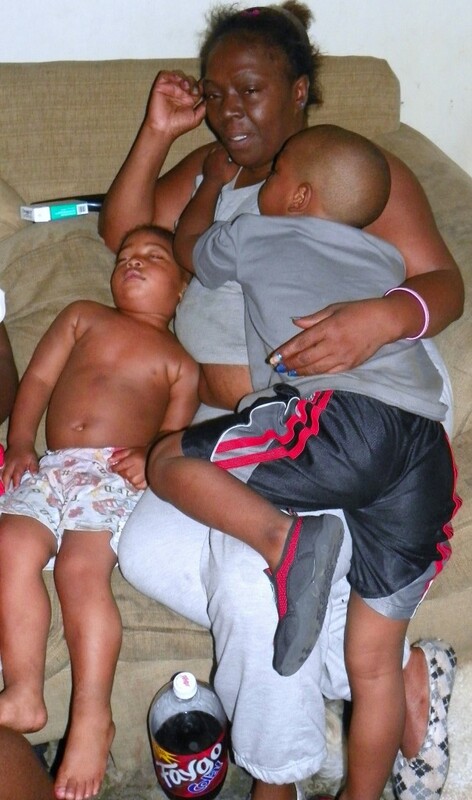 Mertilla Jones and grandchildren after 2012 raid. “Certain police officers are harassing us to this day,” Jones said. She acknowledged knowing at the time of Aiyana’s death, from television reports and neighborhood talk, that Je’Rean Blake, 17, was killed on the May 14, 2010, but only peripherally. Jones’ son Charles and Owens are stilling awaiting trial in that case. Owens has been held without bond since May 16, 2010, while Jones has been held without bond since November, 2011. Weekley has been free on personal bond to go home to Grosse Pointe, where he lives. The Jones/Owens trial has been delayed while prosecutors await a ruling from the Michigan Supreme Court on Wayne County Circuit Court Judge Richard Skutt’s action barring “jail-house snitch” Jay Schlenkerman’s third-hand hearsay testimony against Jones. “Jail-house snitch” Jay Schlenkerman at preliminary exam for Charles Jones. Jones said Owens did not live with her, but in the flat above her. She said Mark and Markewell Robinson had been staying with her for two months after their grandmother’s lights were shut off. Fishman then introduced photographs which had been the topic of a lengthy discussion without the jury present at the beginning of the day. They are from Mark Robinson’s Facebook page, allegedly showing Robinson and Ellis with guns. Fishman said he intended to use them to impeach witnesses, including Mark Robinson, who testified earlier that he warned the raid team there were children in the house. Although he did not testify about his own possession or use of guns, Robinson was banned from the trial that day because Fishman said he might recall him to the stand. Moran objected to introduction of the photographs at length during that session, saying there is no evidence of when the photos were taken, where they were taken, and by whom. He cited the Michigan Rule of Evidence he contended they violated and said he would preserve his objection for an appeal. Hathaway nevertheless ruled to admit the photos, saying she would give instructions to the jury on whether they could be used to impeach witnesses. 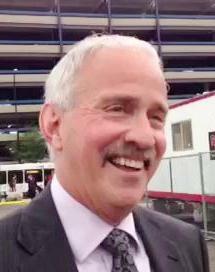 Moran, who is also prosecuting Chauncey Owens and Charles Jones, did not object in detail in front of the jury, indicating only that his objection had already been noted. 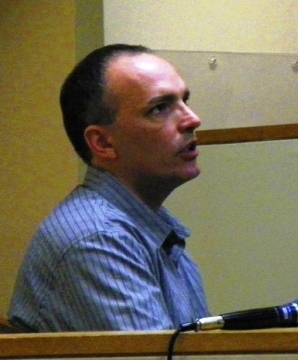 Hathaway gave no instructions to the jury when the photographs were introduced. Fishman then handed six full-page glossy photographs to the jury to pass among themselves. All photographic evidence until that day had been displayed only on video screens. The photos were not shown to the audience or media. A glimpse of them as they were passed along to the jury indicated that most were blurry. The jury never saw or handled any photographs of Aiyana, which are numerous on Robinson’s website. 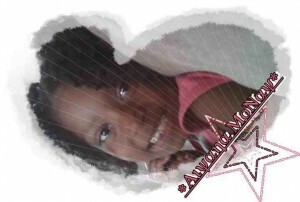 Of 230 photos on the site, almost all are loving photos of Aiyana and of the many other children in her extended family. The site is no longer up. Group of Aiyana’s cousins and other relatives with T-Shirts demanding justice for her kiliing. Photo from Mark Robinson’s Facebook page. Fishman asked Jones to identify the people in the photos. Keeping her composure, she identified Mark Robinson, Vincent Ellis, and Mark’s brother Markewell Robinson, but said the guns appeared to be rifles, BB guns, or toy guns. On re-direct, she told Moran that she did not take the photos and did not know when or where they were taken, and re-iterated her testimony that she had not seen the individuals in question with guns. Fishman asked her if she was aware that State Police found 14 shell casings in the backyard of the home, again “facts not in evidence,” at the current trial. Jones said she never went into the home’s backyard and that hearing gunshots in her neighborhood was common. During later testimony from officers, Fishman asked each of them if any of them would go into a house and deliberately murder a child. “You must be joking,” one said. Fishman told this reporter after one day’s hearing that Jones should never have told her for a Voice of Detroit story that police murdered Aiyana. In fact, it has been this author’s experience during years of covering killings by police that family members frequently characterize the killings as “murder,” and in fact they are frequently deliberate. 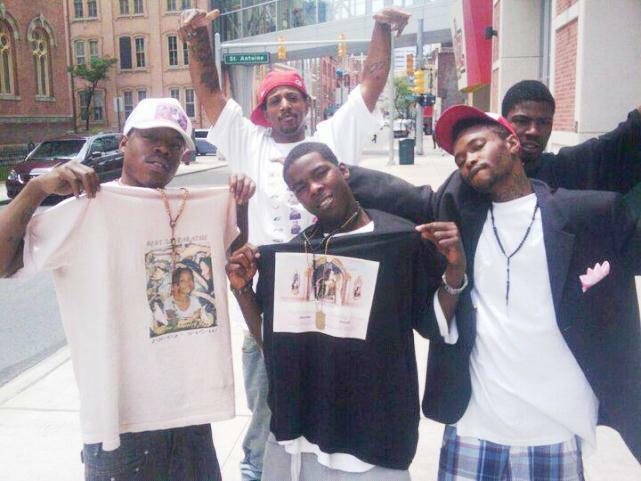 Detroit police officer Eugene Brown bragged about killing (l to r) Rodrick Carringon, Lamar Grable, and Darrne Miller. In the case of Lamar Grable, 20, shot 8 times to death by three-time killer cop Eugene Brown in 1996, his mother Arnetta Grable said she had spoken with Brown’s cousin. The cousin said Brown bragged about being able to kill people as a police officer and get away with it. Grable later won $6 million in a civil jury verdict in the case, but Brown has never been charged criminally and is still on the force. 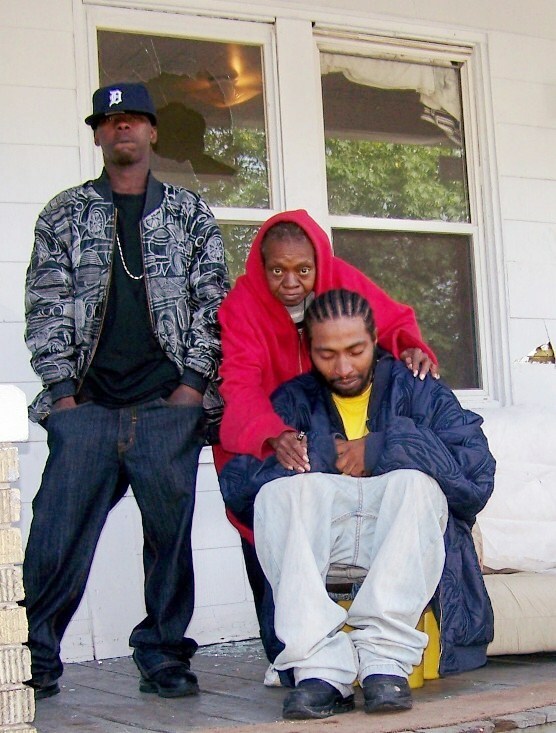 Officers Barron Townsend and Steven Kopp chased Tommie Staples, Sr. into an alley in 2008 and shot him to death as he lay under their car, simply because he and his wife were advocates for youth in the neighborhood when they were stopped by police. The family won a $2.5 million lawsuit settlement in that case. 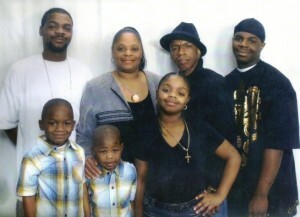 Townsend and Laron York killed Dennis Crawford, a father of five, in 2005 during a domestic violence call. Another Facebook photo from killer cop Michael Reizen’s page.